In a large saucepan, bring water to a boil. Add quinoa. Reduce heat; simmer, covered, 12-15 minutes or until liquid is absorbed. Remove from heat; fluff with a fork. Transfer to a large bowl; cool completely. Place parsley, mint, onion and garlic in a food processor; pulse until finely chopped. Add tomatoes and cucumber; pulse until coarsely chopped. Add tomato mixture to quinoa. 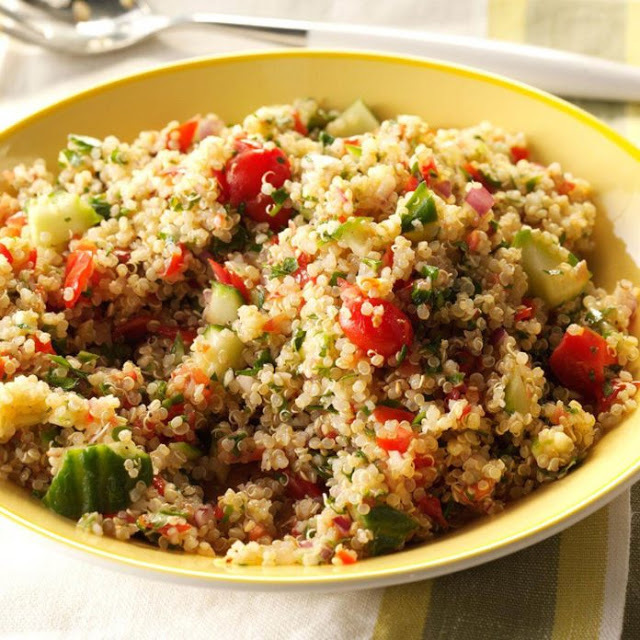 In a small bowl, whisk lemon juice, oil and seasonings until blended; drizzle over quinoa mixture and toss to coat. Serve at room temperature or refrigerate until serving. 2/3 cup: 163 calories, 6g fat (1g saturated fat), 0 cholesterol, 403mg sodium, 22g carbohydrate (2g sugars, 3g fiber), 5g protein. Diabetic Exchanges: 1-1/2 starch, 1 fat.